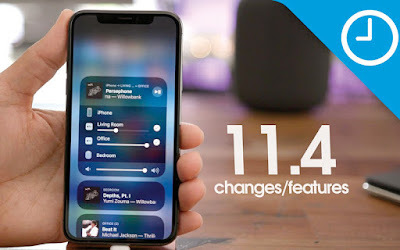 Apple today seeded the second beta of an upcoming iOS 11.4 update to developers, two weeks after releasing the first beta and three weeks after releasing iOS 11.3, a major update that introduced several new features. The iOS 11.4 update introduces a new ClassKit framework for educational institutions, which will support new features announced at Apple’s March 27 event. For standard users, the iOS 11.4 update adds features that were originally present in the iOS 11.3 beta but removed ahead of release. It includes support for Messages on iCloud, designed to store your iMessages in iCloud and sync them across devices. There’s also support for AirPlay 2 features, with the Apple TV once again available in the Home app. With AirPlay 2, the same audio content can be played in multiple rooms. On the HomePod, there are signs of support for stereo sound, but stereo sound is not currently available as it requires 11.4 HomePod software not available for developers. iOS 11.3, the previous update, introduces a new Battery Health feature for monitoring the status of your iPhone’s battery, Business Chat for iMessage, which lets you communicate with companies directly in the Messages app, ARKit 1.5 with augmented reality improvements, new Animoji on iPhone X, Health Records from participating medical providers, and more. Update: Mentions of the non-functional HomePod stereo pairing feature have been removed in iOS 11.4 beta 2, and Apple has added a new (PRODUCT)RED wallpaper for the iPhone 8 and iPhone 8 Plus. ← Sony Xperia XZ2 Premium Lunched With 4K HDR Display And Dual Camera.